I am so excited about the new homemade shout I whipped up two days ago. If you have ever talked laundry with me, you know that I am just bad at stains. I can never get them out even if I remember to try. Enter Jillee, writer of One Good Thing. I love this lady...she spends time reading about how to make things like shampoo or deodorant so I don't have to. She has a recipe for "Shout" that is changing my life. Not only does it work, it leaves no trace of the stain and doesn't distress the fabric (like scrubbing fruitlessly with a toothbrush). Not that I am a lunatic, I haven't bathed my children in it, but now that I think about it...no...well, Annabel's head does always smell blonde. Ok, so I think this mix is awesome. Clever segue to new laundry routine. Ok! The big idea. The system that makes my laundry piles disappear. The genie in the washer. Not happen' ladies (I assume all curious men are now gone). Laundry is laundry is laundry, and in this house there is a lot of laundry. Three kids, two sets of cloth diapers, cloth tissues, cloth wipes, cloth paper towels (made the break over two years ago...not nearly as hard as you would think) adds up to about 12 loads a week, but I did find a way to make it less overwhelming. Picture this: You dump a washer full of unsorted laundry into the washer. Process in your preferred way. Put the dried clothes into a basket and walk to the kitchen napkin/washrag/towel drawer then fold the clothes and put them away into that drawer with out piling up in-between. This has changed my life. Truly. I have a hamper or bag and a day for each type of laundry. Linens in one, kids clothes in another, and another for adult clothes (come on...Luke and my clothes...as if I have any of those that fit). When I am done with that type of laundry, I quit (or do diapers which I also put on a schedule...thanks Jenn). So. Much. Better. I don't keep up. I pretty much never get it all put away, but at least I sometimes feel like I have finished something. That is worth a lot in my world. There it is! I do two or three loads per day. I still start the first load the night before and let it soak. Then I chase it for the rest of the day. Leave a comment if you have a laundry routine that works for you. Mom, you could leave a comment and then come see if your idea works. opps.. I see the link now. Sorry. O'k, I am so impressed by this! I would love to change to cloth paper towels, wipes and tissues - how did you do this? What do you use for these? We've not been doing cloth diapers and I don't know that I'll switch now (Lilys close to potty training) - but maybe for any future babies?? Any tips would be so appreciated! Also, I've been looking into homemade laundry detergent - do you have a recipe you use? Thanks for the inspiration!! I am still using my first set of Perfect Size Fuzzi Bunz. I have tried other things, but I love love love my FB's. 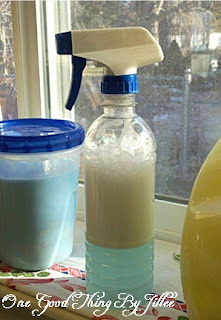 I have a recipe for laundry detergent in my recipes tag...not ready to say I am thrilled yet. Cloth paper towels will freak everyone out, but I just have lots of dishcloths and some reserved for grease draining. I have been known to toss a cloth rag after a true disaster.